Avonu wrote: From these texts I suspect there are plenty of islands between Enroth and Antagarich, one of those we visited during sir CHristian AB campaign. Well, there's Regna, and the Dagger Wound Islands. 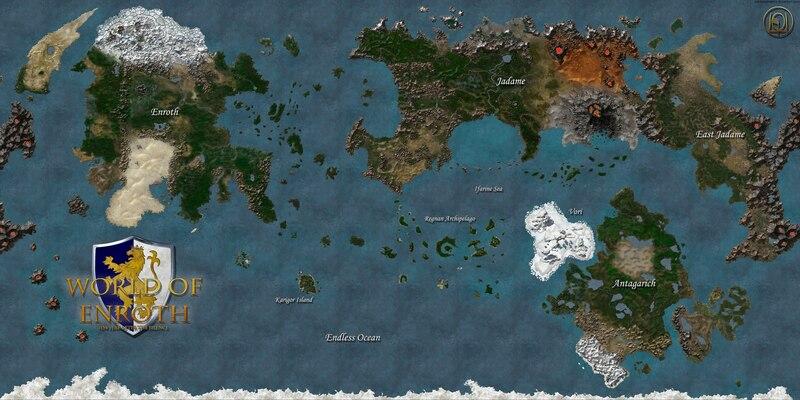 Might be some more islands to the south of Regna, though. I've always imagined Jadame as being rather small, since we hear so little about it. Hmm. The problem is, that Regnan Islands starts 200 miles to East of Enroth. Regna and Dagger Wound Islands are much, much futher. Besides you have these "petty kingdoms and tribes" on them. Ifen when we count Bootlag Bay islands, Karigor and MM8 islands, that still seems to be much lower number then suggested by these texts. Also, sir Christian moved from one of such archipelagoes and kingdoms to other with each map and ended eventually near western coast of Antagarich. Asomath wrote: Looking good, Katarn. I'll review it later for accuracy, but on first glance, it looks well off! I've updated the main post with it, so it is easier to find. I've replaced the old map with a new, revised version. 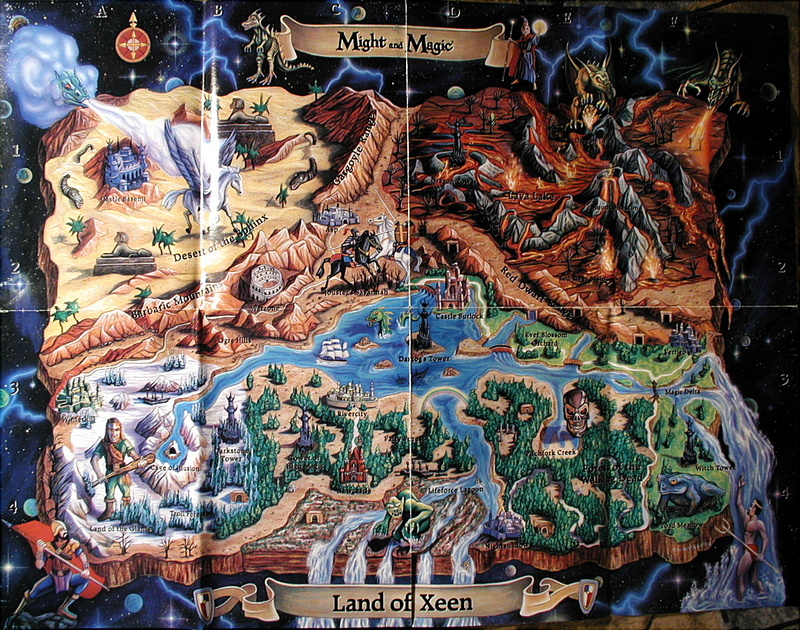 Many, many landmarks were added, lands were revamped to fit more closely to their in-game visage, there was some continents and islands rearranging and more. Endless Ocean is less endless now, but judging from the MM6 intro, there's not so much space between the continents. What caught my attention were enrothian roads. As for the one leading to Agar's laboratory through a frozen wasteland, it's a bit of a stretch, I guess. But who knows, maybe someone was attending to it, so it's not hidden beneath the snow. On the other hand, road leading to Abdul's desert resort straight through the Dragonsands was too much and I've decided to not place it on a map. As those roads are pre-silence, the desert part would have to survive the Day of Fire, years of abandonment and tons of sand. When you come to think of it, from what exactly the Ancients produced them ? I've added more towns, especially on Antagarich, they were mostly taken from non-randomized town names found in H3 campaigns. There's a region added on Enroth which placement concerns me and the fact that the whole continent is apparently re-imagined between H2 and MM6 doesn't help either . Carator Mountains were placed to the south of Free Haven, close to Darkmoor. As they were supposed to be south from the initial battles of the Succesion Wars and in some distance from the dwarven domain, it seemed to be the best location for them. Asomath wrote: As for the islands, it is definitely suggested that there are many many more. Yep, there's no doubt there should be a lot more islands here and there on the Endless Ocean, yet we know virtually nothing about their exact location, shape and name. I've decided to add only those islands about which we have at least symbolical knowledge. Thanks to that the map is, hopefully, venturing less into the fanon territory . Last edited by Katarn on Jan 3 2018, 23:36, edited 1 time in total. If you don't want to draw the islands, you could add a black blob around Karigor and label it "Here be dragons"
Thank you for all the information that I have found here. I thought it was very helpful. 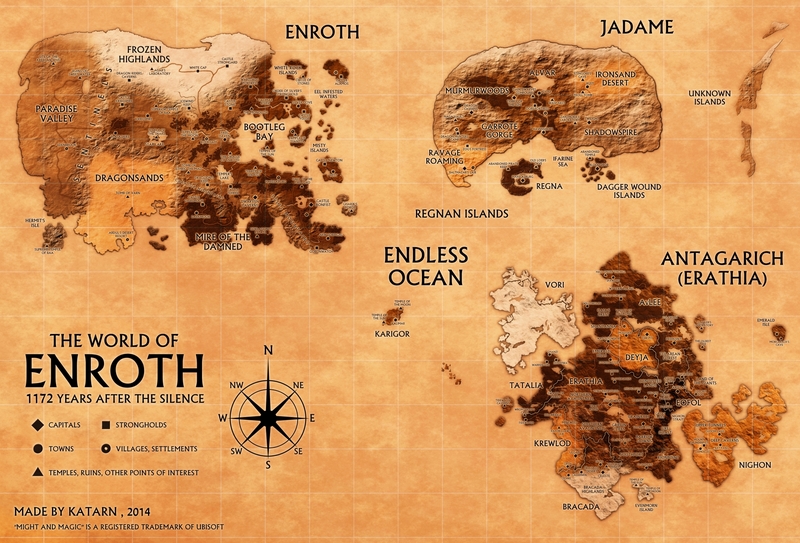 It is most believable world map of Enroth i have seen so far, thanks for great job. Last edited by Rodril on Mar 10 2017, 19:07, edited 1 time in total. @overall: the ice is caused by the Sword of Frost. Last edited by Asomath on Jun 25 2017, 13:51, edited 1 time in total.